This article was published first in pagina12.com.ar on April 3. Translated by Michael Otto. The National Constitutional Assembly (ANC) issued Tuesday night [April 2] a constitutional decree that “authorizes the prosecution of citizen deputy Juan Guaidó” in application of Article 200 of the Constitution. The text was read by the president of the Assembly, Diosdado Cabello, in response to a request from the Supreme Court of Justice (TSJ) which had asked the ANC to lift Guaidó’s parliamentary immunity. The decision implies that the investigation of Guaidó’s culpability will continue via the normal legal system. In January, the Public Prosecutor’s Office, with the authorization of the Supreme Court of Justice, opened an investigation into “violent acts in the country, pronouncements by foreign governments and the freezing of assets of the republic, which would imply the commission of serious crimes that threaten the constitutional order.” With the lifting of parliamentary protection, the process will continue through the Supreme Court of Justice. To understand why the request was made to the ANC and not to the National Assembly (AN), as dictated by Article 200, it is necessary to remember that the AN has been in contempt since 2016 — due to the refusal to reopen the elections of three fraudulently elected deputies — and has not respected decisions taken by the judiciary. Several powers have thus been assumed by the ANC, made up of 537 members elected on July 30, 2017, with powers framed in the provisions of Article 349 of the Constitution that grant a higher rank than the power so constituted in the AN, which is currently subordinated to the mandates of the ANC. Guaidó’s response, speaking to the media after learning of the ANC’s decision, was to ignore the legality of the decision, as well as that of the Supreme Court of Justice. He replied with a reaffirmation of his will to continue with his plan: “If they want to move forward, let them do it and suffer the consequences. What is the political price to pay for a regime that kidnaps a president in charge?” he asserted, describing the “regime” as “desperate,” and that if he were arrested, it would constitute a coup d’état. He called on his followers to remain in the streets, to summon forces for Saturday, April 6, the day on which the “Exercise Operation Freedom” will be staged, and to set in motion the “organized strategic mega-protest.” Thus far he has not given any details about how the so-called operation will be implemented, although he had already announced that [his forces] would create “freedom and aid committees” that would spawn “freedom cells” without providing any explanation. The decision of the ANC marked a political moment of stagnation and reversal for Guaidó’s process of consolidation. His calls for mobilizations have not been able to reach higher levels of intensity, despite the narrative that he claims to represent 90 percent of society. He has not been able to develop new initiatives that would allow for a breakthrough to change the balance of power. His latest unsuccessful moves were focused on trying to promote and profit from unrest provoked by the blackouts and the subsequent lack of water — for which the government holds him responsible. Guaidó’s public agenda only has Saturday’s action for a roadmap. The very real possibility of Guaidó being arrested would be a true test of his national support: Would it trigger a massive mobilization as he predicts? Or, on the contrary, would he fail to gain any more support than he has from his own social base that feels at least partly deceived because he hasn’t kept his promises to immediately [replace Maduro]? And also and above all his international backers: What will Donald Trump’s administration be willing to do when faced with the possible lack of national support? Will they take one more step? Their ambiguous rhetoric, which blows hot and cold with threats to intervene militarily or not, would have to be clarified. The debate in the ANC — which is composed of pro-Chávez deputies because the opposition did not [run candidates] in the July 30, 2017, elections — considered two central issues: justice and national and international politics. In the first case, the need not to permit impunity, owing to the gravity of events spearheaded by Guaidó. 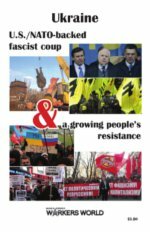 In the second case, the relationship of forces: the timing of the attempted coup at home, as well as the dynamic in the international arena. The latter has escalated in particular with the presence of the Russian Federation, which has carried out diplomatic actions and military cooperation with the Venezuelan government. A high official of the U.S. Department of State has suggested that the U.S. will make that point at the NATO meeting to be held this week [April 2-4] in Washington. During the next few days, and particularly on Saturday, April 6, it will become clear what real capacity Guaidó has for a mobilized response. In this regard, it’s always important to remember two things: First, there is a publicly announced plan and another one prepared in the shadows, which involves armed groups, mercenaries, and has a schematic of military escalation. Second, it is sectors in Trump’s government and in the deep North American state that direct the strategy and finance the actions.